While I was away this weekend doing Homemade Delish appearances, my husband & author, Rick Pipito, went to work taking care of the kids. As a surprise, he wanted to make a nice dinner for me for a change. Boy has he come a long way. 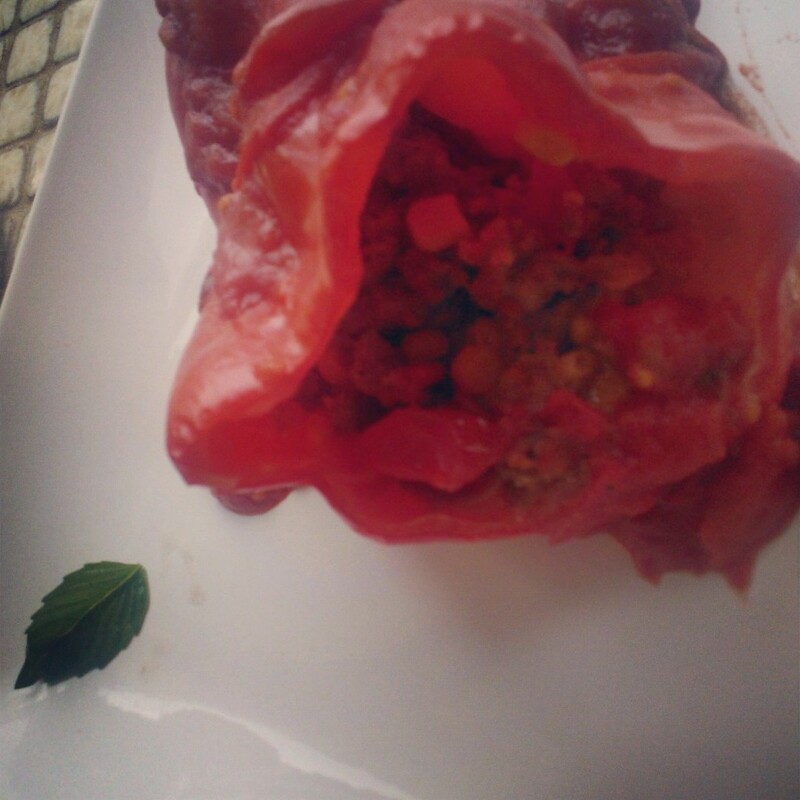 He calls this dish Amalgamated Peppers. It is the perfect blend of Stuffed Peppers and Sausage and peppers. Really tasty, and I kept wanting more. He even plated it himself. He wrote down the recipe, and here it is, the one that will keep your mouth watering. Chop up 8 nice sized tomatoes (in this case it was from our own garden) and begin cooking them in a medium sized pot. You want to slow cook them until the skin begins to fall off. Add fresh Basil leaves (approximately 5 chopped up), and 4-5 garlic cloves. Throw in salt and pepper to taste, and a tablespoon of red pepper flakes. Finally, add 2 small cans of tomato paste to thicken it up. Brown 1 lb of mild Jimmy Dean sausage in a pan. With a wooden spoon, continue to chop this up so it is small and doesn’t burn. When it is fully cooked, but not browned, remove from heat, and stir in 2 (5 oz cans) of unsalted corn. Shred 2 cups of cheese (I used mild cheddar) and stir that in as well. Take the stem and seeds out of 3 large red peppers. Boil the peppers for about 7 minutes. Remove from pot, and immediately stuff them solid with the filling. Place in a preheated oven on 375 degrees and bake for another 5 minutes or so. Keep an eye on them. You want the skin to just begin to wrinkle on the peppers. When done, remove from oven and plate them by pouring the homemade red sauce atop them. Enjoy! This dish serves 3 adults.